"His brain is still working. They're learning." 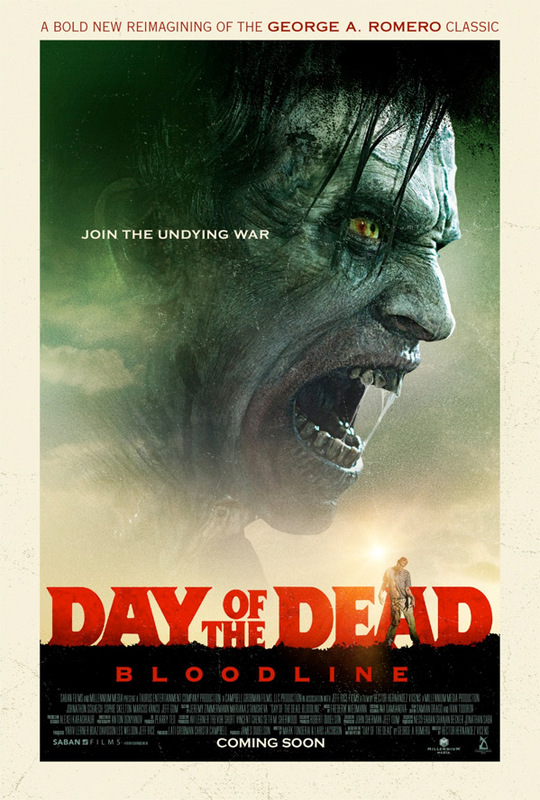 Saban Films has released the official red band trailer for a new zombie movie called Day of the Dead: Bloodline. This is basically a remake of the classic original George A. Romero zombie movie Day of the Dead, released in 1985, though it's being called a "reimagining." The plot is about a group of military personnel and survivalists living in an underground bunker trying to survive the zombie apocalypse. The main character is a young woman named Zoe Parker, played by Sophie Skelton, who is "tormented by a dark figure from her past" - surprise, that figure is now a zombie. The cast includes Johnathon Schaech, Jeff Gum, Marcus Vanco, Mark Rhino Smith, Lillian Blankenship, and Shari Watson. This doesn't look that good at all, but if you need more zombies in your life, have at it. A reimagining of George A. Romero’s cult classic, Day of the Dead: Bloodline is set in a post-apocalyptic, zombie-filled world where a former med school student (Sophie Skelton) is tormented by a dark figure from her past. The only thing is, he’s a half-human, half-zombie hell-bent on destroying her world. Day of the Dead: Bloodline is directed by Spanish filmmaker Hèctor Hernández Vicens, of only The Corpse of Anna Fritz and "Pol & Cia" previously. The screenplay is written by Mark Tonderai & Lars Jacobson, based on George Romero's original characters. This hasn't premiered at any film festivals. Saban Films will release Day of the Dead: Bloodline in select theaters + on VOD starting January 5th, 2018 next month. Anyone?